Coonoor tourism takes visitors up into the remote regions of the Nilgiri Hills in south India's southern state of Tamil Nadu. Quieter than nearby hill station of Ooty, Coonoor offers visitors the same emerald landscapes to explore, the possibility to travel by mountain steam train, acres of tea plantations and a climate that is refreshingly cool when compared to the plains of Tamil Nadu and Kerala. Coonoor is a bustling town that 'climbs' up a hill and the best accommodation is found out of the town centre up the steep hill towards Bedford Circle roundabout. Outside of town there are numerous trekking and walking options that will take you past tea plantations, waterfalls, forests and stunning valley views. You almost certainly will see small monkeys running along the rooftops and through the trees. Highfields Tea Estate Take a free tour through Highfield's tea factory where you can see tea picking and processing. A nearby shop sells freshly picked and prepared tea and offers taster sessions. Take a bus to Highfields from the bus stand in town or from Bedford Circle. Sim's Park Upper Coonoor's 12 hectare botanical garden houses various species of pines, tree ferns, camellias, magnolias and more. Annual fruit and vegetable show is held in May. Dolphin's Nose Viewpoint 10 kms from Coonoor a beautiful view over the valleys and Catherine Falls. Nearby Lamb's Rock viewpoint gives views of tea plantations and spectacular mountain scenery. View Over Town From Bedford Circle the walk down into the town centre gives incredible views of the tiled rooves, mosques and temples beneath. When the calls to prayer mingle and float above the sounds of the busy town below creating a surreal and memorable atmosphere. Arrive By Steam Train The Nilgiri Steam Railways passes through Coonoor and must be the best way to arrive. The Nilgiri Mountain Railway operates between Mettupalayam and Ooty, and Coonoor is a stop on this route roughly half way between these destinations. Book ahead for any journey or arrive at least 45 minutes before departure. From Mettupalayam transport can easily be arranged to other Indian towns, or ongoing journeys can be undertaken from Ooty. 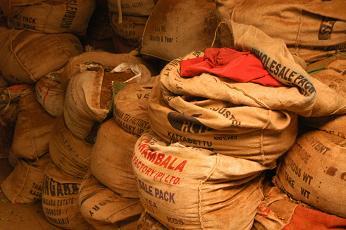 Coimbatore in Tamil Nadu is the nearest large city. The main bus stand is in central Coonoor at the bottom of the hill that leads to Upper Coonoor. Buses cover various Tamil Nadu destinations, and local buses go up the steep hill to Upper Coonoor. Frequent buses leave for Ooty and Tamil Nadu's other Nilgiri hill station of Kotagiri. Ask locals about which bus to catch if you get stuck! We stayed in Hotel Vivek (www.hotelvivek.com/index.php) which is on Figure of '8' Road near Bedford Circle, about 1km up the hill from Coonoor town. 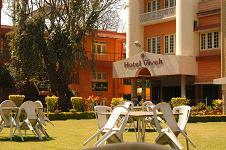 It is a huge complex of 60 double rooms ranging through Dormitory, Standard, Deluxe and Suite. We payed R.880 for Deluxe which had incredible views over the tea fields and was a large, clean room with balcony and 24hr hot water. 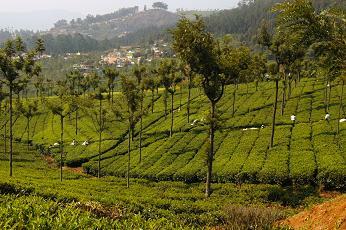 Staff can provide Coonoor tourism information. There is a bar in the hotel, and food can be served outside at tables on the lawn. I had a huge thali for R.60. (tel. 2234426) which is in Upper Coonoor. For (quirky) luxury, try The Tryst (www.trystindia.com) where all the rooms are decorated in differing styles such as Egyptian, Victorian, Indian, Country Cottage and so on. Booking ahead is recommended, The Tryst is closed from May to September outside of Coonoor tourism season. The food in Hotel Vivek was very good, so it is worth finding it if you are in the area. Hotels often serve their own food. In Upper Coonoor, Rangoli Restaurant on Orchid Square serves great Indian food in nice surroudings. The Only Place on Bedford Circle serves convenient fast food. SUMMER March to April/May, 15'C - 25'C, peak season. 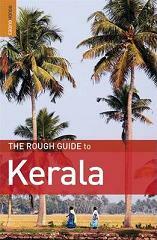 Monsoon May/June to Sept., heavy rain can make trekking difficult. WINTER Oct. to Feb. 10'C - 20'C, bring warm clothes for cold nights. This Coonoor tourism guide is part of a larger site focusing on the Indian destinations of Goa and Kerala and the surrounding areas.